Ronnie O'Sullivan trails Joe Perry 9-7 after two sessions of their second-round match at the World Snooker Championship in Sheffield. 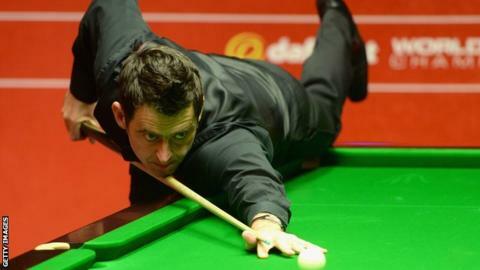 Defending champion O'Sullivan has not led at any stage of the high-scoring best-of-25 match so far. Perry twice held a three-frame lead but missed a chance to end the day 10-6 ahead as O'Sullivan ultimately prevailed in a tense 16th frame. The match resumes 10:00 BST on Saturday. Perry led 5-3 overnight but O'Sullivan took the first frame of the second session by recording a break of 93, the highest of the day. Perry won four out of the subsequent six frames to establish a 9-6 lead, claiming his highest break of the session (88) in the 14th. Both players spurned good chances in the final frame of the day before O'Sullivan cleared from yellow to pink to triumph 68-38 and cut Perry's lead to two frames.